Pyrenees Andorra Dates 2 pers. Skiing in France When it comes to skiing, France is always the best destination with top ski resorts. 7 of the top 10 interconnected ski areas are in France, the ski lifts are the most sophisticated in the world and the variety of resorts will guarantee a good time. Welcome to The Pyrenees Located between France and Spain, top French ski resorts are located in the Pyrenees and the destination is a great pick for family-oriented holidays. It is also a great destination for holidays makers looking for authenticity, as the atmosphere gives a real taste southwestern France. Pyrenees skiing is a choice you will not regret ! 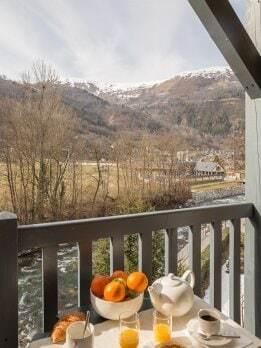 Two top ski pyrenees resorts: Ax-les-Thermes and Saint Lary Soulan Our residence Ax-les-Thermes les Trois Domaines is located in the heart of Ax-les-Thermes. The resort is between 1400 and 2400 m high and is great for the whole family with sunny slopes and a snowpark. If you are worrying about the snow, snow cannons guarantee the coverage on 80km of ski runs. Our complex offers recently renovated apartments with baby facilities and day nursery. Our residence Les Rives de l'Aure is located in Saint Lary Soulan, a beautiful village of the Valley d'Aure surrounded by high peaks, including the Pic du Midi. The recently renovated apartments include a balcony or terrace and thermal baths are accessible directly in the resort. Our accommodation in Pyrenees 2000 The resort ranges from 1700 m to 2515m. Located in the Catalan Pyrenees, our residence Pyrenees 2000 Le Sequoïa is a self catering Pyrenees accommodation and a top family ski accommodation Pyrenees. All apartments are fully equipped and the location is ideal: you will literally be able to jump from your bed to your skis ! Access from the centre of Soldeu in Grandvalira, in the high Pyrenees. Magnificent natural environment: natural glacial parks (Madriu-Perafita-Claror) and lakes (Cercle dels Pressons). An ideal destination for outdoor sporting activities and a paradise for shoppers. The price shown is per accommodation, for a Studio Standard 2 people from Fri 07 June to Fri 14 June 2019 . The price shown is per accommodation, for a Studio Standard 4 people from Tue 23 Apr to Tue 30 Apr 2019 . Overlooking the resort, your residence offers stunning views of the Cerdagne. Aquatik residence: access to the Targassonne indoor swimming pool (5 km from the resort). Location in the centre of Font-Romeu and immediate proximity to all essential shops. The price shown is per accommodation, for a Studio Standard 2 people from Wed 29 May to Wed 05 June 2019 . An ideal location near the entertainments and shops. - Aquatik residence: free access to the Targassonne indoor swimming pool (5 km from the resort). The price shown is per accommodation, for a Studio Standard 3 people from Tue 23 Apr to Tue 30 Apr 2019 . In the Pyrenees, in Andorra, at an altitude of 1950 m.
Comfortable, new apartments with magnificent mountain views.